"Western psychology has proved to be a popular launching point for Western teachers, especially in literature. "Books of this nature teaching Buddhist principles in a linguistic environment associated with psychology, have become almost ubiquitous. 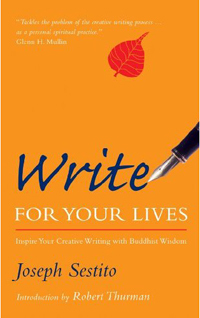 Joseph Sestito has taken the movement in a fresh direction and given it an altogether different context, with his new book, Write For Your Lives. "Combining his training in the Western psychological disciplines of cognitive behavioral therapy and behaviorism with his study of the Buddhist traditions, he tackles the problem of the creative writing process as an enlightenment-oriented art, as well as a personal spiritual practice. As a therapist who is also a practicing Buddhist, he looks at conscious patterns and structures of mind from both Western and Buddhist perspectives, and presents a picture of how the creative impulse becomes either constricted or released." — From the forward by Glenn H. Mullin, author of more than 30 books on Tantric Buddhism and Tibetan culture.